Looking for history, Southern charm, gourmet dining, and an enchanting Inn? Look no further than the Woodbridge Inn, located in Jasper, GA – the self-proclaimed “First Mountain Town.” Originally known as the Lenning Hotel, the Inn first started hosting guests, many of them Floridians trying to beat the summer heat, in 1880. In 1976, with its glory days well behind it, the Rueffert family bought the Inn and set about to revitalize the now crumbling structure. With the whole family helping out in whatever capacity needed – whether it was shucking oysters or pitching in with the dishwashing – the Inn was a labor of love for the Rueffert’s. The history of the spot where the Inn is actually goes much further back. Like, a lot further back — to the Cherokee, whose reign began centuries, perhaps millennia, before the Lenning’s came along. This spot was a favorite worship site for the Cherokee, who held their prayer as the sun came up over Sharp Top Mountain. Much later on in the chronology, Andrew Jackson was commissioned to Florida to battle the Seminoles and his troops took Old Federal Road, on the west side of the Inn, as they made their way south to Florida. According to local lore, both Union and Confederate forces camped on the site…no doubt not at the same time. Hans Rueffert has lived at the Inn since he was four-years-old; 44 years now. Throughout those years, the Inn has grown in stature to once again become the go-to-spot, not just for Floridians, but also folks from all parts of the world when they visit the North Georgia Mountains. Hans’ menus feature a panoply of appetizers as well as a gourmet menu, famous for steaks and locally sourced produce, Hans has added a daily “Wellness Bowl” – with a delicious blend of greens, legumes, and fruit and other savory herbs – that is both vegan and gluten-free. The Woodbridge Inn have been featured on The Food Network, CNN, Georgia Traveler, as well as publications like Southern Living, Atlanta Magazine, and the Atlanta Journal-Constitution. It also garners great reviews from sites like TripAdvisor.com and Yelp.com. The hotel at the Inn has 18 well-appointed rooms, with panoramic mountain views on one side, and the beautifully landscaped grounds on the other. Close to the heart of downtown Jasper, you can take a leisurely stroll into town and shop in the local boutiques and galleries. You will notice the Woodbridge Inn water tower, like a beacon attracting regulars and neophytes alike; that tower is still in use for water supply by the City of Jasper. Only an hour-or-so from downtown Atlanta, the Inn is close enough for an enchanted evening of dining and enjoying the grounds of the Inn. Only 45-minutes from the upscale North Georgia mountain community of Blue Ridge also makes this the perfect dining destination. 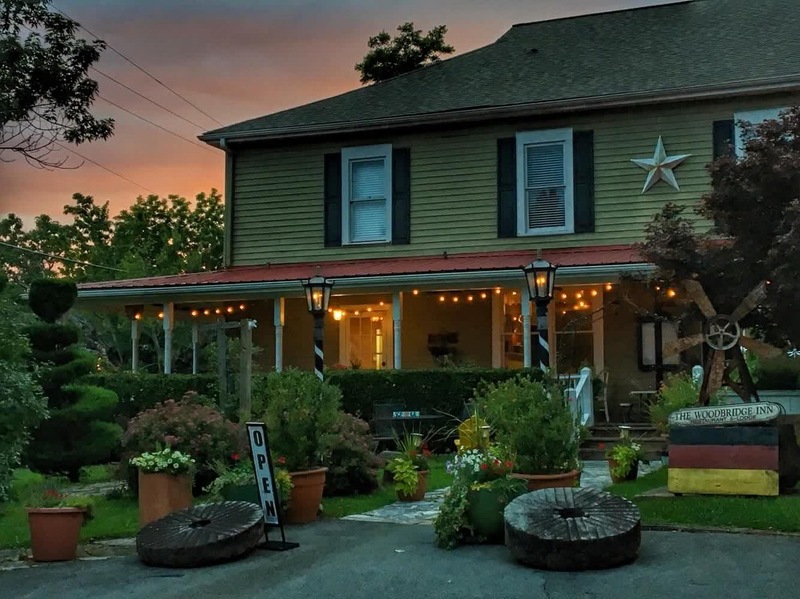 Out-of-towners can enjoy not just the fine cuisine but the graceful Inn, as well. The Woodbridge Inn is a true destination for everyone. Come and see for yourself!